We, miniature gamers all know that the end of the world exists, commonly otherwise known as the table edge. This most unfortunate feature even calls for special rules, brings in players gamey behaviour. Everyone is aware this straight daunting line can trap units, others vanish by being forced to jump in that void, and at times it acts as a saving deep fog allowing escapes. The trouble is, the fog stops at the table edge. In many ways for battles, prior to the last century, when they were fought on a limited sized sort of field our tables are Ok as long as one has the needed space fitting with the fight, or more often the fight fitting in the space. When say after the middle of the 19th century as these fields became huge, or certainly with WW1 and 2, there is no more rectangular battlefield but a huge continual even possibly fluid battle over hundreds or thousands of men and hundreds of km of front. Ok skirmish or nearly so engagements can still be raids, patrols, or the like that are fought in a sort of void on a limited space be it between the lines, behind etc. or very limited in time fights in closed up areas. Simply put your average ww2 fight whether it is a company against another (say IABSM ; bolt action Pzer grenadier etc.) or battalions (Command decision, Spearhead…) should be part of a bigger operation. The sides of this fight you play, unless very special cases, well, are connected to other units. In other words there are no safe sides to your table. I am talking here mostly of the lateral sides, assuming at least a quasi linear sort of field not to complicate one life. If your table is say 4km x 3km as in a Command Decision/ FFT3 game, the potential interference is not very great but can still be potent, of maybe 1/5th of the table length in each side. In real life any unit moving in these sector should be somewhat concerned about what lies on those sides. In our games they are not, they can even benefit from them as « secure ». If you have any idea about the average troop densities, it will encompass at most a few 100 m in each directions. Then your actual action can be totally dominated by something that is out of the table. It becomes even more utterly theoretical to have such a fight in the context of a continuous front without this consideration. Of course we have the other trouble that your T34 driver, if the terrain is good would just jump off table if he sneeze with his foot on the pedal. Say 40km/h for 200m, 20 seconds ? Yes I know, it is just a game…and it should stay so. I never said anything against it yet? We may add to the game in a way that would make it better by putting it a bit into its context. In creating in the player more of the actual reactions, worries and feelings of the real chaps. You must think only a gamer of the « simulationist » type as me would be bothered by these existential but for most, swept aside troubles. I will try to show you why they are in some ways killing your games and set some sparse ideas to go around the problems, and I’d welcome comments, and certainly even more ideas to make things better. As I often try to say to the guys «who plays only» but do not care much about the simulation side: nothing but the game mechanisms make it fun, and also those can or not worry about the, yes I will use that scary word, « realism ». What your tactics, the results, your choices and behaviour on the table will make the game a simulation or just a game that happen to be with miniatures that look like their historical counterpart instead of fantasy ones. The two can easily combine, they are just game mechanisms. So now that I found myself some two problems, can I start getting solutions? Sol 2 Use smaller miniatures like 6-8mm. But don’t cram the place again! Sol 3 Several steps, making use of modern technologies. In truth there is no excuse for not using them instead of still playing like in the 80s. 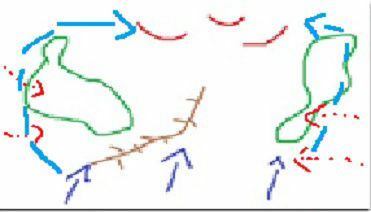 1 Make a battle field, drawn on your computer or use an overhead picture. It does not need be very accurate nor a work of art (you could make yourself a bank of pictures of your terrain elements, most of us do not have an endless amount of it ;) Use it as a sketch of the whole battle, even those parts you cannot have on your limited table size. Have a system, say Skype (?) of distant communication and imagery. Use it to discuss your set ups and plans before the face to face game, to deploy in rough zones and numbers, the troops of each side, preferably with fog of war and a quick system of pre-game reconnaissance (more on that later here !). All this can and should be done from home, nicely when you have time, it saves a lot of it when you have your precious face to face playtime. It also allows for what historically happens a lot: the « non battle » ; when both sides, well, find it not too good to slug it out. I am sure some of your game days were spoilt by this occurrence, whether the scenario turns out to have a flaw, or some terrain was, you know, too close form that edge of the world… Non battle? Try again. 2 Now each side might have a quick strategy thinking and a quick drawn / written, which ever you like, idea of the general plan. I assume you use a system that slows troops with hardly a chance the one on the right will ever be going on the left (ex Fire and fury and derivatives) or orders and delays. It means a good deal of your initial positioning will stick. In military wording, each will have its Area of Operation. 3 Now each side might figure out there are sectors of the battlefield which will be quiet or nearly irrelevant to the final act. You can literally cut them off your now to be installed table /game field. If you complicate your life and have a quiet centre then allow a sort of small neutral band in the centre to lay down those chaps who come in or more likely go out in there. Now some of the lateral sides of your table fight will have secondary fights or some troops there, in fact Off table. Note this system is not perfect, just tries to allow bigger battles on smaller spaces or some things to be or fight just yonder out. This not only good for WW1/2. Think of the light troops fight off the main field at Minden . It could be Plancenoit for Waterloo. 4 fight your main fight the usual way, but with the occasional effective result off table that might or not (player choices and chance) interfere with your main battle. You may consider using some features of the solutions of problem #2. 1 Define roughly what can lie out there on the sides and interfere with your game. In fact you should quickly come to very similar stuff. A few Mgs, Anti tank guns, guns, if modern maybe helos etc.…If you get in very low scale, platoon / company sized game, in truth the closer from the sides, the nearer everything it can be. We do not want to get in to a complicated, detailed set of sort of game in the game. Either those guys out there have a fight of their own which should keep them busy most of the time, or want to stay put in a game of cat and mouse, hidden in waiting. In either case low interference. In truth if they have a real lot of interference (think of a dominant position in Italy nearby, 1944 ?) your game might just not be relevant ; better forget this option. Any scale in between can be, with variants. 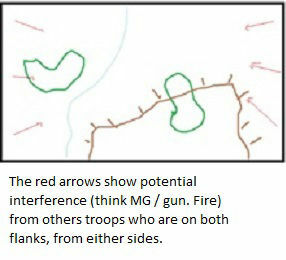 On this sketch Blue is attacking red positions. If you are not using my ideas, well red is pretty screwed up as there are two massively covered approaches for blue on either outer sides of the woods. Yet if you look at historical actual fights, you get plenty of that. In real life those sectors should be covered at least quite some, by other positions out there. Otherwise we have an isolated box… they would probably have chosen another place. Use cards. On some put MG fire, some with guns, and some with both. Get plenty. Put a variable number of blanks inside to make it unpredictable. Take off a few at game start so that one who has learnt all stats about it has lost his time trying ;). You can have blue on blue a bit. After all we are talking of a different outfit /AO… It needs not really be stated, in war there is nothing like “friendly fire”. Now in the course of the game, especially if we are talking of one of a larger scope, encompassing hours of fighting like Command decision, those flanks might become secure, one or both for one side or another. They might stay in doubt. For larger scope games you can draw a line (put a marker on a side) if necessary to show the extent of the depth of friendly positions. Obviously there should not be enemy fire from behind that line. Then depending on the degree of interference you want, draw cards, allow the players to keep a few to play in his hand. Note, the cards should have a say 6-7/10 chances to actually work so as to not be magical. After all those chaps out there are not obeying you. The result, in the above table, the guy who wants to skirt that wood, might get badly shot up from the flank, just as he would in real time. He will have to act with it in mind. You might not even want to go into details: no need to say on card: 88mm gun shoots.. you might say just have ATGs are firing on you, your tank has x chances of being knocked out. We assume these chaps off won’t bother shoot a 37 on a Tiger.. The whole process is to make you act and think more realistically, without spoiling the game.